A few weeks ago, I featured the deeply impressive letter written by the (then) eleven-year old Matty Keating from Clayhanger, who is appealing for help to get a skate park for Clayhanger. At the time, I found Matty to be courteous, polite and eloquent, and was very taken with his mature and thoughtful approach to his cause. Since the initial approach, Matty has been campaigning further, and has elicited the help of councillors and the local press: last Tuesday (3rd February 2015) it made for a really nice article in the Express & Star, the text of which I include in full below as it doesn’t seem to be online anywhere. Congratulations to Matty and his pals, and especially Matty’s pal Dylan Griffiths, who also wrote to the council about this last year. Keep campaigning folks, you’re all a credit to your community. I’m aware of some disquiet in Clayhanger about potential nuisance from a skate park, but I implore those concerned to meet the kids and talk to them. These are very community spirited youngsters, and they’ll listen and are reasonable. They are part of the community just like adults, and deserve a fair hearing. Such positive energy deserves nurturing and encouraging – these are the Clayhanger residents of the future. If you can help the campaign out, please comment here or mail me: BrownhillsBob at Googlemail dot com, and I’ll pass the messages on. Cheers! Matty, who got his first scooter 18 months ago, said: ‘I like to go on my scooter after school and at weekends but I have to ask my parents to drive me to the skate park in Cannock. Councillor Marco Longhi has offered advice and support to the young campaigner. ‘It is fantastic that someone so young is getting involved in campaigns and is willing to put himself forward and fight. Matty said: ‘Mr Longhi told me I can talk at a meeting and tell councillors what we need. Sport England and the lottery. ‘It was their own idea and Matty wrote the letter out himself. Clay hanger’s Park is lovely, but not great for older kids, especially in Summer. Imagery from Bing! Maps. 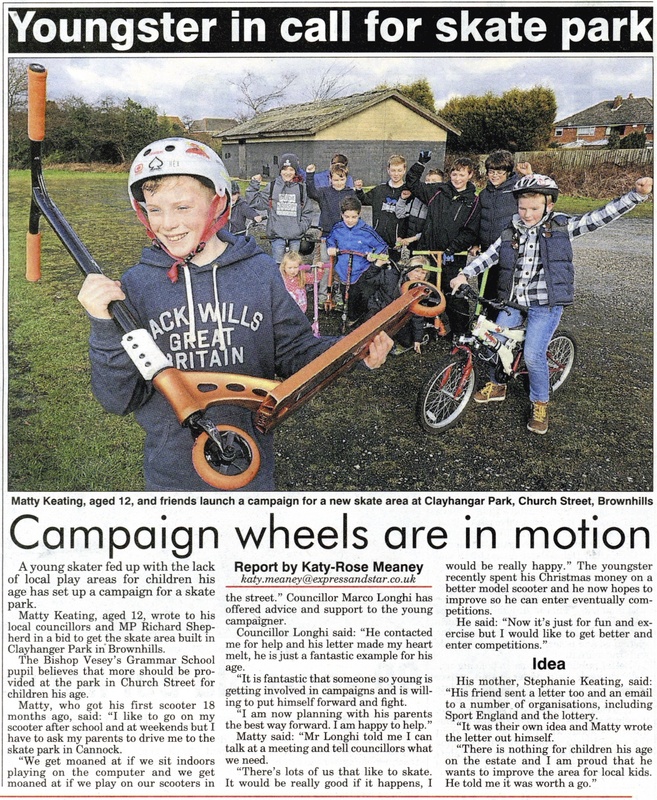 This entry was posted in Brownhills stuff, Clayhanger stuff, Environment, Express & Star, Followups, Fun stuff to see and do, Local media, Local politics, News, planning, Reader enquiries, Shared media, Social Media, Walsall community, Walsall Council and tagged 2015, Brownhills, campaign, Children, Clayhanger, Clayhanger Park, Dylan Griffiths, Express & Star, football, kids, Lichfield, Matty Keating, play, Politics, Skate Park, Things to do, Walsall, Walsall Council. Bookmark the permalink. Not a surprise to hear the disquiet, the same people moaning about the potential skate park will also moan if the kids use their scooters by the shops or on the footpaths. There is an old saying “you just cant win”. Well lads you can win……… keep going, youll get there. It’s the attention it will bring from other areas all clayhanger kids would be fine,as they all pretty much know each other it’s such a small area…. wouldn’t it be okay if it was built right across the field so it’s not by the houses…If your gonna do the skate park sort the disaster of a park out for my little ones to,we have to go elsewhere. Due to dog poo, beer and glass etc..